The coming Passover holiday represents a make-or-break moment that could decide whether Palestinian violence and terrorism fizzles out, or escalates into a new and more dangerous phase. Israel's defense establishment is on alert to the possibility that tensions surrounding Jerusalem's Temple Mount (known to Palestinians as the Al-Aqsa holy site) could resurface and trigger a new outburst of terrorism, just as a seven-month wave of largely unorganized terrorist attacks begins to draw down. The tensions could well appear again during Passover, when the number of visits by religious Jews to the Temple Mount rises. There is no shortage of elements in the Palestinian arena – from Hamas media outlets to social media users – who will eagerly present such visits as part of an imagined Israeli conspiracy to take over the site. As a result, Israel's defense establishment has advised the government to prohibit any politicians, from any political party, to further inflame tensions by visiting the site. Against this background, the Shin Bet domestic intelligence agency has quietly thwarted a steady flow of mass-casualty, organized terror plots, planned and orchestrated by Hamas. Any one of these plots could have changed the strategic picture and led to an escalation on multiple fronts had they materialized. Hamas has been deeply disappointed by the recent decrease in terrorism and by its failure to bypass Shin Bet's intelligence networks. On April 18, a Palestinian bomb blew up on board a bus in Jerusalem and injured 21 civilians, including, possibly, the bomber himself. A media ban is in place that prevents publication of further details on the investigation. 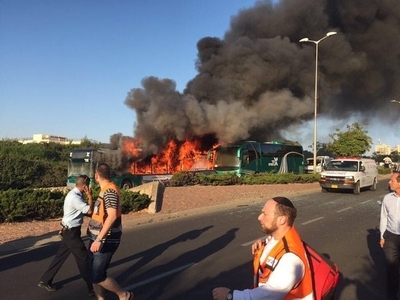 Israelis watched TV news broadcasts of scenes of a bus in flames and emergency vehicles attending the site with much concern. They had hoped such bombings, which tore through Israeli cities in the dark days of the second Palestinian Intifada 15 years ago, were long behind them. Unlike 15 years ago, Israel's security forces operate all across the West Bank on a nightly basis to thwart attacks. Yet it only takes one plot to slip through the cracks for the terrorists to achieve their goal. The bus bombing goes to show the inherently unstable nature of the security situation. On one hand, the number of terror stabbings, shootings, and car ramming attacks – all part of the unorganized violence – have plummeted in the past two months. On the other, such incidents could soon resurge and be joined by organized, more lethal events. Fatah's official Facebook account praised the bus attack, but this is only part of the real picture. Away from the rhetoric, on the ground, the Fatah-ruled Palestinian Authority has actually improved its security coordination with Israel, and has stopped 20 percent of organized terrorism plots brewing in the West Bank, according to figures cited recently by Defense Minister Moshe Ya'alon. A senior Israeli military source said in April that "tensions in Jerusalem, particularly in the context of Al-Aqsa, are there. It characterizes the holiday period. We are going with the working assumption that we will encounter this." The source described seeing "a lot of orchestrated terror attempts by [the large Palestinian] organizations. We can see many attempts being made on a continuous basis." In West Bank raids, security forces discovered ready-made explosive devices and high-quality assault rifles, like M-16s and Kalashnikovs in the possession of would-be terror cells. "The numbers [of such attempts] are high," the source said. "But we are very effective. "The Shin Bet is a very significant aspect of this. Although there are attempts, and there is very high motivation [to carry out attacks], we succeed in thwarting them, and they have not been able to reach a situation in which they can really launch a quality attack." Ten would-be kidnapping terror plots were thwarted since October, the source added. Israel's defense establishment also is improving in an area that it has, until now, really struggled to deliver results – the ability to pick up warning signs of a lone-wolf attack and stop it in time. Improved social media analysis, using new big data algorithms, are part of this improvement, defense sources say. Meanwhile, to the south, the IDF announced this week the detection of a new Hamas cross-border attack tunnel, stretching from the Gaza Strip into southern Israel. 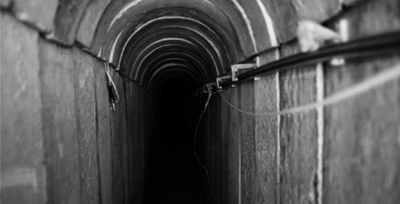 It is the first tunnel discovered since the cessation of hostilities in August 2014 between Hamas and Israel and represents the renewed effort by Hamas's military wing to prepare attack options for when war breaks out again. Hamas views the current ceasefire as a tactical regrouping break. It has no intention of stopping its multi-generational jihad against Israel's very existence, and it views Gaza as its base of operations for this "holy war." The Hamas military wing, the Izzadin Al-Qassam Brigades, is readying itself for future conflict. It is manufacturing rockets, mortar shells, and digging tunnels for Hamas's elite Nuhba force of 5,000 heavily armed guerilla-terrorists who make up one quarter of all of Hamas's armed members. The plan was to inject these murder and kidnap squads into southern Israel through tunnels. But Hamas's tunnel tactics are now in trouble. Israel used new technological and intelligence capabilities to detect the new tunnel, and has invested hundreds of millions of shekels in the research and development of new detection systems. If the IDF's Southern Command can begin to systematically detect tunnels as Hamas digs them, and destroy them, Hamas would find itself wasting treasure and blood (many workers die in tunnel collapses during the construction stage) for very little return. Hamas would lose one of its main investments in its future offensive capabilities. That frustration could spur Hamas to try even harder to set up cells remotely that sow death and destruction in Israeli cities. Israel's intelligence personnel will continue to work around the clock, away from the headlines and spotlights, to prevent that from happening. Now I know why the U.S. is being flooded by immigrants. Until we can attain a world that is free of violence we will have mass migration to the U.S. and other civilized first rate countries? What a screwed up world of humans? My God we will eventually destroy what remains of humanity.